"Symptomatology" redirects here. This subject requires a separate article. A symptom (from Greek σύμπτωμα, "accident, misfortune, that which befalls", from συμπίπτω, "I befall", from συν- "together, with" and πίπτω, "I fall") is a departure from normal function or feeling which is apparent to a patient, reflecting the presence of an unusual state, or of a disease. A symptom can be subjective or objective. Tiredness is a subjective symptom whereas cough or fever are objective symptoms. In contrast to a symptom, a sign is a clue to a disease elicited by an examiner or a doctor. For example, paresthesia is a symptom (only the person experiencing it can directly observe their own tingling feeling), whereas erythema is a sign (anyone can confirm that the skin is redder than usual). Symptoms and signs are often nonspecific, but often combinations of them are at least suggestive of certain diagnoses, helping to narrow down what may be wrong. In other cases they are specific even to the point of being pathognomonic. ^ "Sumptoma, Henry George Liddell, Robert Scott, ''A Greek-English Lexicon'', at Pursues". Perseus.tufts.edu. Retrieved 2011-12-17. 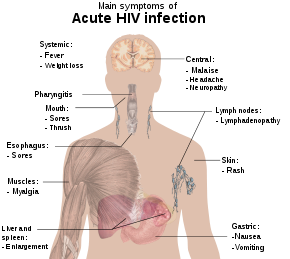 ^ "What Are Signs And Symptoms And Why Do They Matter?". Medical News Today. Archived from the original on 6 December 2017. Retrieved 5 December 2017. ^ a b "Encyclopedia of Mental Disorders: positive symptom". Minddisorders.com. Archived from the original on 2012-01-02. Retrieved 2011-12-17. ^ "Mental Health: a Report from the Surgeon General". Surgeongeneral.gov. Archived from the original on 2012-01-11. Retrieved 2011-12-17. ^ a b Understanding Psychosis Archived 2012-12-25 at the Wayback Machine, Mental Health Illness of Australia. ^ The British Medical Association (BMA) (2002). Illustrated Medical Dictionary. A Dorling Kindersley Book. p. 406. ISBN 978-0-75-133383-1. ^ David A. Bedworth, Albert E. Bedworth (2010). The Dictionary of Health Education. Oxford University Press. p. 484. ISBN 978-0-19-534259-8. Archived from the original on 2018-05-09.